Discoveries of gold in the 19th century spurred a flurry of privately minted gold issues, which today are extremely scarce and popular with collectors. There are dozens of recognized pioneer gold issues generally ranging in denomination from $1 to $50. Many issues were made in very small batches and are rare, while others were struck by larger assay firms that produced more sizable runs over a period of several years. 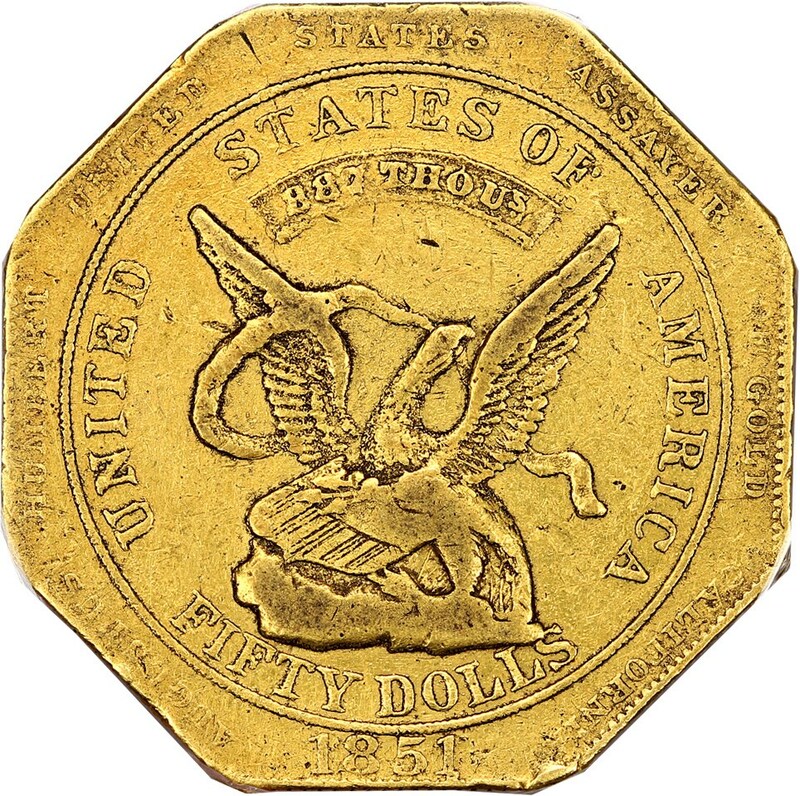 For example, the Bechtlers of Rutherford County, North Carolina, produced a series of gold dollars during the 1830s that widely circulated throughout the Southeast before the arrival of the first official federal gold dollars by the United States Mint in 1849. Wass, Molitor & Co. of San Francisco was also a major distributor of gold coins denominated as $5, $10, and $20 pieces during the 1850s. Also counted among the pioneer gold issues of the 19th century are pieces from a provisional government mint known as the United States Assay Office. This operation, run by former New York watchcase maker Augustus Humbert, produced an eclectic variety of gold pieces ranging in sizes from $10 to $50. The designs on many private gold issues from the 19th century roughly replicate motifs that were simultaneously seen on federal gold coinage of the day. However, many of these gold issues are one-off productions often bearing crudely executed designs. Despite the rough condition and appearance of several pioneer gold pieces, they all have an important story to tell and are coveted by numismatists who specialize in gold coinage or early Americana.